For several years, Fiesta Key has been the winter destination of choice for SPSC members. Located on Florida Bay just west of Islamorada, Fiesta Key offers excellent sailing for all skill levels, from beginning longboarders to bump&jump shortboarders. The winter winds are typically northeast to east 10-30 knots, and make for a side to side-on launch. The launch is a little tricky and the shallow coral bottom in the launch vicinity will munch fins, and slice feet. Once aboard, watch out for the two north-trending sandbars on either side of the campground; the westerly one is marked on the outside by a channel marker, the easterly by a short piece of pvc. There is a third sandbar out in front of the bridge, which you might encounter on a north wind. FYI, the sandbars can hold stingrays, and an east wind which cranks for 2-3 days will bring portuguese man-o-war into the bay (if you go snorkeling after an east blow, be sure to snorkel on the downwind side of the boat!). Regarding amenities, the KOA campground is far from primitive and includes a swimming pool, two hot tubs, a marina, a store, hot showers, and a bar & grill. The campground is lushly maintained with gorgeous invasive exotics, and the campground staff are windsurfer-friendly. More information regarding this year's trip. We spent 2 weeks on the North Shore of Maui. Most of our sailing was done around Kanaha and Sprecklesville Beach. The vast majority of our sailors' collective experience has been in flat water and steady wind, with a few token wave sailors in our midst. The conditions in Maui, by contrast, were choppy inside the reef with some smallish waves on the reef and big swell on the outside. Most of our sailors found the conditions challenging, but wonderful. Those interested in waves sailed upwind from Kanaha to Sprecks and spent the majority of their time on the reef. The intermediate sailors, of which I was one, enjoyed making runs out to the reef and back, practicing turns and learning to handle the chop and small waves. Those new to shortboard sailing took advantage of the daily wind to practice their waterstarts and turns, all returning to Shell Point with more confidence and skill. We all agreed that Maui was heaven, the only downside of the trip being the long and expensive plane trip. Definitely, two weeks is the minimum to make it worthwhile if you're coming from the east coast. Oh yeah, and the food is terrific if you like sushi and fresh fish. The Gorge offers access to excellent conditions for every kind of sport that I take an interest in and then some: windsurfing, hiking, camping, snowboarding, mountain biking, skiiing, kayaaking and rafting, etc. Not to mention the fact that you walk around the entire time you're there saying, "Oh my god, this place is so beautiful!" I'm not sure how long it takes to get over that. I didn't in the 10 days I was there. Anyway, about the windsurfing, since this is a windsurfing site, the conditions on the river are quite unique in that the wind is blowing up the river and the current, natch, is flowing down the river. Therefore, sailing upwind is not the challenge that ocean sailors are accustomed to, since the force of the currents offsets the tendency to stray downwind. Proficient waterstarting is critical here, if you can't get back on your board fairly quickly, you can find yourself downcurrent in a hurry. We made our visit in the spring and wetsuits were definitely necessary, I understand that is the case all year long, especially if you are a southern species of windsurfer. During our visit the water was about 65 degrees, but not uncomfortable in a decent wetsuit. The food was great in Hood River, the camping in the county campsite was fabulous, the people were super nice and shop (Big Winds) was totally decent to us. A don't-miss windsurfing vacation in our opinion. We visited the DR in the summer of 1999 with one intermediate windsurfer, two advanced windsurfers and an observer from another planet. While the OFAP's review of this spot might be the most interesting and objective, I'm the intermediate so you will hear my version. The town of Caberete was very busy and charming in a third world kind of way. That is to say, people trying to sell you stuff constantly and traffic wizzing by on the highway consisting of bikes, donkeys, delivey trucks, taxis, hambre perros, and pedestrians all fighting for space. A little spanish is good, you don't need alot of money or a car and the lodgings are cheap. We rented our gear from Vela, very decent and informative. The sailing was either on or off. When it was blowing, the sailing was just great with small swell increasing to fairly big waves on the reef and big swell on the outside. Unfortunately, the wind only blew 2 out of the 9 days we were there and there's not alot to do in Caberete without wind. Station 59 for NE to SW, Station 10 (across from Ft. Sumter) for W/NW, both located on Sullivin Island. Also check out the windsurfing store (Sailsports) before you get to the island on the right. There, Fast Eddy will tell you some local tales and may lead you to a free sample at the local Microbrewery (run by board heads). WindTalker: (803) 883-9817, NOAH report: (803) 747-5859. On the I-275 causeway on the St. Pete side right next to the bay bridge. Any wind direction, but best for NE to S. Flat water on the bay side, waves under the bridge (strong currents!) and on the Gulf front. Also, at Ft. De Soto, last exit on I-275 coming from St. Pete before the bridge. Strong wave conditions and flat water on small inlet for SW to NW, but very strong currents possible in the waves; launch from North Beach. More launch sites for any wind directions from several other beaches of the park. Another launch site is off Dunedin causeway, all directions except for E. Flat water and chop sailing. Yet another place is Howard Park: take Klosterman off US 19 between Tarpon Springs and Palm Harbor. Take the causeway to a small key which offers flat water on the inside (very good for beginners; shallow enough to stand up), chop sailing on the outside. Any wind direction except for E. Camping: Ft. De Soto. Hot Showers. 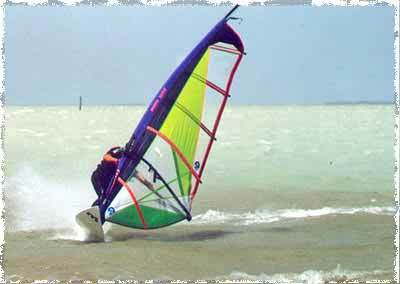 Windsurfing stores: Tackle Shack (Pinellas) and two other places (one makes the MultiSail). Microbrewery: Hops and another (better) place (name?) on US 19, just north of the 580 intersection. On the Ringling Causeway to Longboat /Lido Key next to downtown (all directions but S) or across the bay from the recreation area next to the marina on Lido Key (for S). Very popular site during the winter time. New store AquaSports next to the airport, also rents equipment at the causeway during the weekend. Wave sailing from any beach front possible. No camping. No showers. Microbrewery: Sarasota Brewing Company. Florida Keys. Launch from the State Park (S winds) or from the "horse shoe" (N winds). To get to the horse shoe, take the first right when coming from Miama, as soon as you get onto Bahia Honda (or was it the key between Bahia Honda and Big Pine?). The horse shoe has strong winds during the winter cold fronts, no wetsuit required! Flat water sailing (mind the corals!) and good wave sailing under the bridges. You can drive onto the horse shoe during low tide but it does get flooded during high tide; move your car in time. Camping in the State Park or at the Big Pine Fishing Lodge. Some camp sites exposed to strong winds, others sheltered. Both camping facilities have hot showers. Windsurfing rentals in the State Park. Big Pine also has a pool and a charter boat for snorkeling trips to the Looe Key National Park reef. Worth a trip during no-wind days, but wear wetsuits any time of the year; snorkeling gear provided. Diving trips and groceries on Big Pine, night life in Key West (about 30 minutes drive). Microbrewery: Kelly's Caribbean Bar Grill and Brewery, Key West. DO NOT SPEED on Big Pine! The area is strictly patrolled (day and night) to protect the Key Deer population.